C2A (Computer Aided Astronomy) is a Planetarium software that allows you to build detailed views of stellar fields. It is only available for the Microsoft Windows Operating System (all versions). 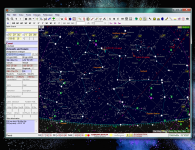 An important objective of this software is to take into account the main catalogues available to professional and amateur astronomers in order to prepare observations on small fields as well as astrometry and photometry works. C2A is also an easy to use general purpose Planetarium software with many functions. C2A is able to display the following catalogues: SAO, GCVS, WDS, Gliese and Hipparcos (all four provided with the standard program distribution), Guide Star, Tycho-2 (both can be downloaded from this site in the Downloads page), USNO-SA1.0, USNO-A2.0, USNO-B1.0, UCAC1, UCAC2, UCAC3, UCAC4, NOMAD, PPMXL, CMC15 and URAT1 (which are not provided with the distribution because of their size). 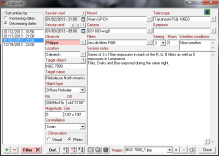 For photometry purpose, C2A natively integrates the Loneos catalogue (UBVRI photometry of faint field stars, which is part of the standard distribution package). C2A is able to access directly over the Internet the catalogues ArasBeAM (for spectral observation of Be stars - see the site http://arasbeam.free.fr/), Exoplanet Transit Database (to plan exoplanet transit observations - see the site http://var2.astro.cz/ETD/index.php) and IAU Meteor Showers (which provides all the known and suspected meteor showers - see the site Meteor Data Center). Finally, C2A integrates an asterism catalogue and it can display artificial satellite positions using orbital elements in the TLE format. Regarding deep sky objects, C2A is provided with 3 catalogues: the Revised New General Catalogue and Index Catalogue (credit Wolfgang Steinicke - see the site Revised New General Catalogue and Index Catalogue), the Catalogue of Principal Galaxies (PGC 2003), the catalogue of the Saguaro Astronomy Club (SAC) version 8.1 (credit SAC - see Saguaro Astronomy Club) as well as a catalogue of deep sky objects based on the RNGC and NGC2000 catalogues. C2A is also able to display field images transferred from the ESO DSS and STScI DSS (Digitized Sky Survey) servers over the Internet. Finally, users have the possibility to associate their own images to various types of objects. The user can also create its own catalogues of objects, either under the form of text files or compiled catalogues. 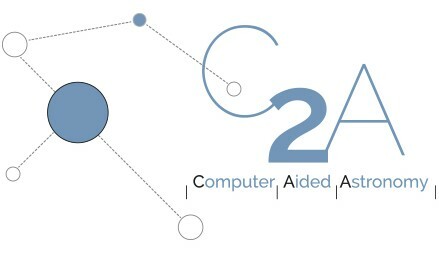 Finally, C2A integrates numerous functions such as planetary position computing, asteroid and comet path display, ephemeris production, telescope control, ... All these functions are described in the Information page of this Web site. C2A is a freeware. It can be used freely out of all commercial activity. The author cannot be made responsible for any damage caused by the usage of this software. It is possible to make a donation should you want to support and encourage the author of the software (but keep in mind that C2A is developed during the author's free time who therefore cannot commit to address all the function requests or bugs which are submitted to him). In order to download C2A, just go to the Distributions section of the Downloads page. Version 2.1.5 available. Version 2.1.5 of C2A is now available for download. This version includes a preliminary integration of the Gaia catalogue (GRAPPA2) and fixes several minor bugs. It also corrects the URL to access automatically the orbital elements on the Minor Planet Center web site. 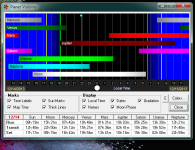 List Of Freeware. C2A is now referenced as one of the best free planetarium programs on listoffreeware.com. UCAC4 catalogue fix. A problem has been reported by the USNO regarding the validity of proper motion of around 3000 objects in the UCAC4 catalogue. A fix can be obtained from the USNO web site. You can easily apply the patch using either a Python script or a small C program which are provided by the USNO. Donations are possible. Following the request from some C2A users, it is now possible to make a donation should you want to support and encourage the author of the software. C2A in Softpedia. C2A has been added to the Softpedia database of software programs. The nice thing about this is that C2A is granted with the "100% CLEAN" Softpedia award guaranteeing that C2A is completely clean of adware/spyware components. The Softpedia C2A page is here. The certificate is available here. 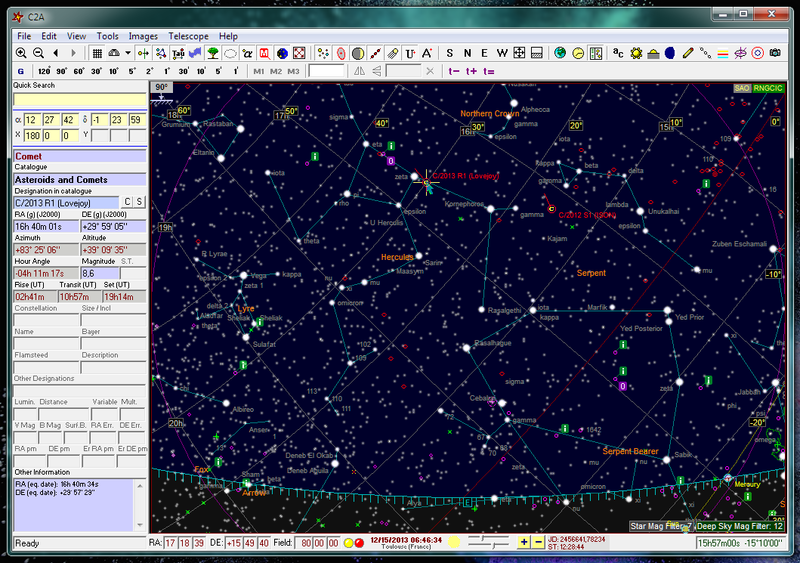 This is a typical C2A screen showing the East horizon where the comet C2013/R1 climbs in the sky. What remains from comet ISON lies on the South. 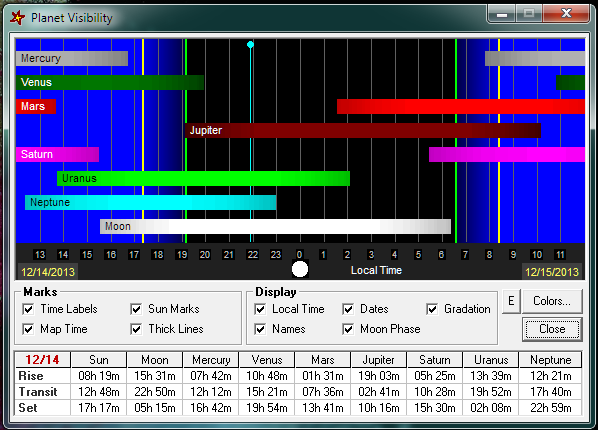 A specific C2A module allows you to get the visibility of all the planets at a glance for a specific date. 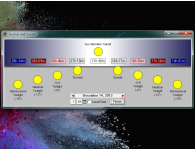 A small tool in C2A allows you to easily get the sunrise, transit and sunset times as well as the times for the different twilights. C2A integrates an observation logbook based on the SQLite database. This logbook can be invoked directly from the objects in the maps. The logbook filter mode allows the user to quickly and easily retrieve a particular observation session using various criteria. C2A integrates a module to analyze FITS image quality (FWHM and sky background) based on the PinPoint astrometric resolution engine. The Sun analemma can be displayed in the maps and represents the daily positions of the Sun over one year at the same local time every day. C2A is able to cool down a CCD camera through several phases with plateaux in order to prevent frost formation. 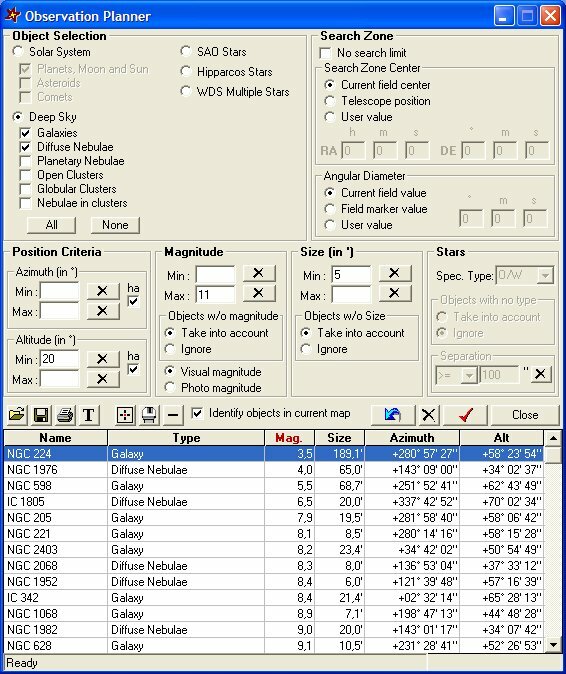 The UCAC4 catalogue is fully supported by C2A and allows the user to get detailed information on stars in small fields. It is now possible to visualize for a given month the Moon phase day after day as well as the disturbance caused by the Moon light for every night. C2A is able to directly control telescopes, either in its native mode or through the ASCOM interface. A simple click on an object in the map allows the user to get its visibility over a period of 3, 6 or 12 months as well as the favorable periods to observe it. C2A displays the main nebulae with their approximate shapes. These shapes are drawn when the zoom level fits their display. 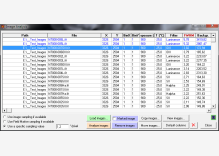 C2A includes an image processing module to perform basic actions on images of all types. 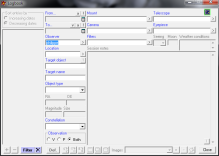 It also allows the user to acquire images through the Maxim DL software. C2A integrates a powerful tool to display field markers for all kinds of optical coinfigurations. This screen shot shows the tracks of an observation schedule with respect to the horizon. 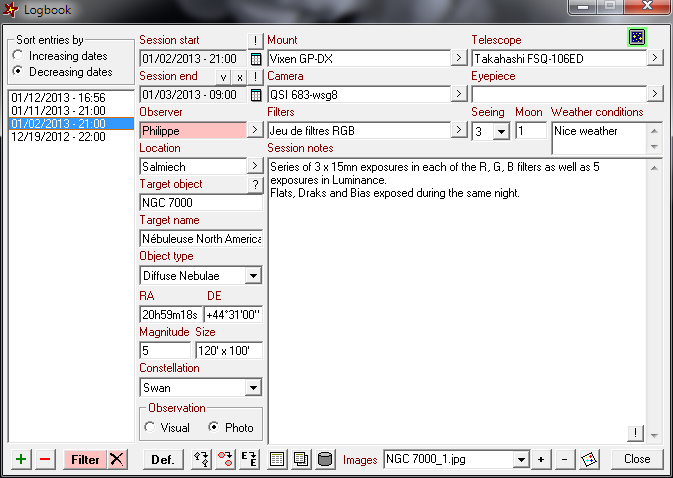 This allows for instance the user to check that observations do not cross the meridian. The observation planner tool integrated within C2A is a powerful means to identify target objets when preparing an observation session. Magnitude 10 star in Lizard for which an exoplanet transit can be observed. View of the Horizon in the South of France, May 2010. An horizon line is displayed and a magnitude filter has been set on stars. Stars from the ArasBeAM Catalogue. The observation priority is represented through a color code (red for the most urgents). Messier 105 in Leo. An ESO DSS image has been positioned in the background. Once can see the good matching with the database objects in the foreground. C2A is simply the best planetarium software available, in my opinion! Rick, February 14, 2012 Let me congratulate you on a fantastic program! I have just downloaded and installed C2A and it works perfectly... I am very happy with it. Thanks for the great job! András, April 12, 2012 La cartographie est faite avec l'excellent et gratuit C2A qui est vraiment super. I very much enjoy using C2A in teaching my classes at College. Richard, April 24, 2012 Congratulations for the superior work on C2A. Peter, May 24, 2012 I have been using your software for a while and really like it! Je trouve C2A très bon, stable et bien documenté. Bravo encore pour ce beau travail. Matthieu, 18 juillet 2012 I've been using C2A for many years while working as an observer. This is a great program, and I would like to thank you for providing such a useful tool. From entry-level observers to astronomer targeting asteroids, I think that this software is 'a must'. Again my compliments on a fine product in C2A. I'm sure that it has gladdened the hearts of many astronomers (both amateurs and professionals). C2A is a great tool. I am abandoning all other software since C2A is really exhaustive. Paolo, November 6, 2012 I want to compliment you for producing C2A. It is an amazing program and very easy to use. I am so impressed with your program I will make a donation shortly to help you and your team maintain and keep C2A updated into the future. Daniel, 8 février 2013 Thanks for your great application and congratulation for your valuable work. I have converted to C2A from being a user of [removed] for many years. Unfortunately [removed] is a little outdated now and could do with a bit of modernising, unfortunately the author is not going to do this, so I thought I would go for a change. I tried [removed] and [removed], and possibly one or two others I cannot remember now, but I do believe that C2A offers much more for the user. it's simple GUI makes it very simple to use and I love it. Andrew, November 25, 2013 Il n'y a pas meilleur Planétarium sur le marché et en plus gratuit. I mentioned using your program to assist in the capturing of the images in this timelapse video I posted to youtube: https://youtu.be/vvJiYou5On4. Your software was very helpful in helping maintain an accurate track during the eclipse. Robert, August 31, 2017 Great to see C2A getting recognition. I am very satisfied and I wouldnt change it. Very light and easy.